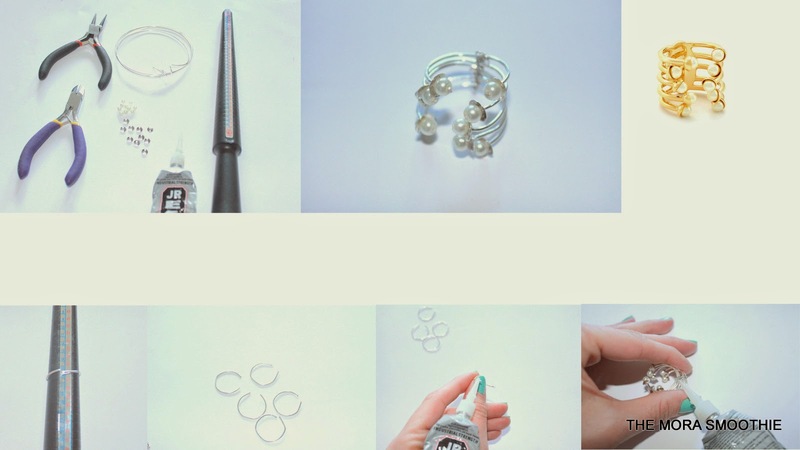 The Mora Smoothie fashion blog, DIY fashion by Paola Buonacara: Fashion DIY ring inspired by Dior! Today I'm gonna post you the tutorial about the ring that you saw here, the idea, as anyone had already guessed, came to me looking at the ring by Dior Diorific, youcan see in the pic. Essesntial: silver wire, pearls, small beads pearls keeper, glue, and then I used as a base measuring rings and a pair of nippers to cut the circles. Tutorial: cut 5 ring as the size of finger, each one on each side I entered the pearls keeper and the bead stopping everything with glue, I finally united with thread the single rings and... et voila the ring is ready! What do you think about? Do you like the result and can notfind it super easy to make? Kisses and kisses and see you to the next post! Oggi vi posto il tutorial dell'anello che avete visto qui, l'idea, come aveva indovinato già qualcuno, mi è venuta guardando l'anello di Dior Diorific, che vedete in foto. Necessario: filo d'argento, perle piccolo, porta perle, colla e poi io ho usato come base un misura anelli e per tagliare i cerchi un tronchesina. Tutorial: tagliate 5 anelli a misura del dito, ad ognuno su ogni lato ho inserito il porta perla e la perlina fermando il tutto con della colla, infine ho unito con del filo gli anellini singoli et voilà l'anello e pronto. Che ne dite? Vi piace il risultato e non lo trovate super semplice? Baci baci ed al prossimo post! So cute, definitely trying this! Le tue creazioni sono sempre meravigliose Paola, complimenti!!! that is really cute! and you're very good with your hands. by the way, i followed you on bloglovin. i hope that you could follow me back dear. Love this DIY!! I'm gonna try it!! Love your result! Awesome DY!! I love this rings!! Wow! You have talent. Thanks for sharing buddy! Ottimo tutorial Paola, l'ho aggiunto a Pinterest. magari avessi un decimo della tua manualità, sei bravissima! Voglio quest'anello! Che brava che sei, io non ci riuscirei, molto carino! sembra facile, sei un genio! Wow!!! You did an awesome job <3 The result is so pretty! Wow! This looks absolutely adorable! I totally LOOOOVE it!! Great job!! You did great! I turned out to be really cute. love this ring , i will try!! Ma sono stupendiii!! provo a farlo uno anche io!! This is soooo cute.Great job! Bellissimo, che brava!!!! Un bacione!!!! Bellissimo look e il lavoro finito è veramente uno spettacolo! Semplice e bello, sei veramente brava! !5 minuti, ma.... bisognerebbe essere brave come te!!!!!! Allora era Dior! Ottimo lavoro Paola! adoro questo tipo di tutorial! bellissima idea e bellissima realizzazione! by the way thanks for your lovely comment in my blog.. would you like to follow each other..? just follow me please and let me know :) i will follow you back soon after that.. keep in touch! Adoro moltissimo di tuoi DIY, fantastico anche questo! Your blog is so cute! It's really cute! Che bella idea, mi piace molto questo anello! aw this look really amazing! Thanks for sharing, i definitely will try it! sul mio blog ne ho fatti un po, mi farebbe piacere sapere cosa ne pensi. Questo post lo giro subito ad una mia amica!!! :D Assolutamente interessante!!!! Wow! I like this DIY. I have to try this when I'm not busy anymore. Wow! This is so nice. I wanna try this too. Thanks for sharing this DIY. Have a great day! also, thanks for the sweet words you left on my blog. i really do appreciate.